Born in Annapolis, Maryland in 1952, Charles studied painting and printmaking at Virginia Commonwealth University and Syracuse University; graduating with a BFA in Painting and Printmaking in 1974. A member of The American Impressionists Society and Oil Painters of America, over the past three decades he has had numerous one-man shows on the East Coast as well as in his adopted state of New Mexico. A lifelong fascination with color expressed itself initially in abstract painting, but since moving to northern New Mexico the brilliant high desert light dictated a change in the direction of his painting. Years of attempting to capture aspects of that light resulted in an artistic output dominated by landscapes, street scenes and gardens. Numerous visits to France and his ancestral home, Italy, have provided an opportunity to explore water subjects, such as the canals of Venice and have provoked a growing interest in human interaction, as can be seen in his numerous paintings of open air markets. “I favor a painterly approach to the handling of the materials whereby a recognizable illusion is achieved, while at the same time the paint itself is celebrated and brushstrokes are not only visible, but are intrinsic to the success of the image. The completed painting should be a world unto itself, analogous to nature, but by no means its slave.” Santa Fe has been his home since 1981. He lives here, very happily, with the light of his life, Melissa, and their eventual dog and cat, who are, as of this date, unnamed. Gold Medal Award, 2013 Oil Painters Of America Western Regional Juried Exhibition. 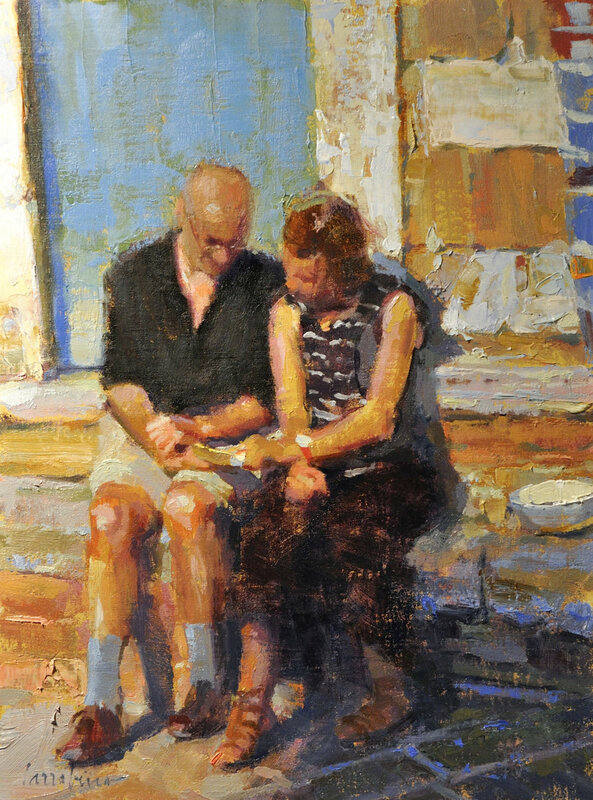 FASO Award Of Distinction, 2013 American Impressionist Society Annual Juried Exhibition. Finalist - March 2016 BoldBrush Painting competition.